The Duchess of Sussex on the second day of her visit to Dublin, Ireland. Meghan Markle is a woman of many talents. In addition to being an actress-turned-royal, she's a fashion maven, women's advocate, philanthropist and, apparently, a makeup artist. After the Duchess of Sussex attended the 100th celebration of the Royal Air Force earlier this week, her longtime friend and makeup artist Daniel Martin took to Instagram to praise her look. "Can we say my love #Meghanmarkle looking #chic AF in @dior today! #slay," he wrote. Martin is the man behind the stunning barely-there makeup the duchess wore on her wedding day, which caused some fans to wonder if he had also done her RAF look. In the comments, Martin responded, "I didn't but she's so good doing it herself, right?" He later clarified to another fan, "She did her make-up herself for this." The Duchess of Sussex at a reception to mark the centenary of the RAF at Buckingham Palace. The duchess reportedly paid for her royal wardrobe herself ahead of her wedding to Prince Harry, so the idea that she would do her own makeup for official outings isn't out of the question. Plus, she isn't the only royal to do this. Markle's sister-in-law, the Duchess of Cambridge, famously created her own beauty look at her 2011 nuptials, Harper's Bazaar reports, despite having a personal makeup artist. The Duchess of Cambridge at her wedding to Prince William on April 29, 2011. Markle has also proven she has master makeup skills. In a 2016 video that resurfaced in May, the duchess can be seen catching an Uber with makeup artist Bobbi Brown and quickly but flawlessly reapplying her makeup with Brown's new beauty tools. A makeup artist was also not listed as part of her and Harry's "11-strong entourage" for their two-day royal tour of Ireland, Hello magazine reports. Martin previously told Glamour that Markle is "very much about keeping her skin as real and natural as possible," which explains her use of neutral colours with only a touch of blush throughout her trip to Ireland. The Duchess of Sussex at a reception on the first day of her and Prince Harry's visit to Dublin, Ireland on July 10, 2018. This minimal look has always been the duchess' go-to, even before she became a royal. 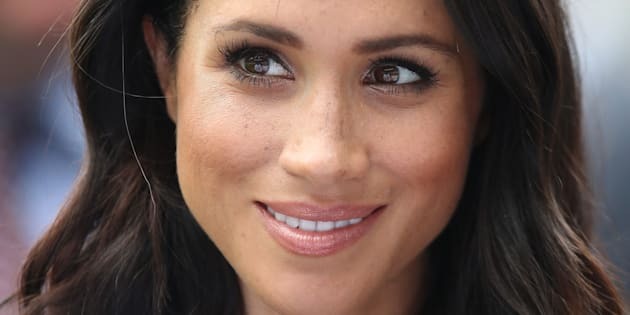 "My routine is very simple — I call it the five-minute face," Markle said in a 2014 interview with Allure. "It's just Touche Éclat, curled lashes, mascara, ChapStick, and a little bit of blush. That is my favourite kind of look. If I'm going to amp it up for night, then I use M.A.C. Teddy eyeliner, which is a really beautiful brown that has some gold in it."